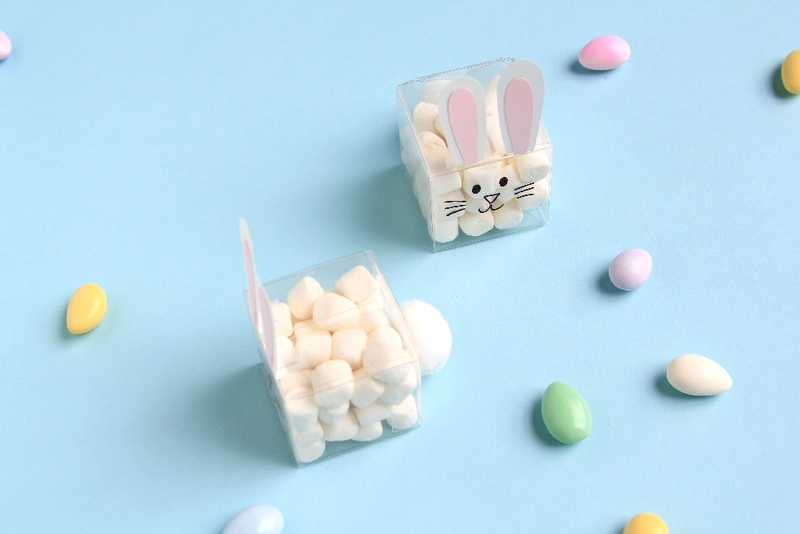 Hippity hoppin’ Easter’s on its way and we have three adorable DIY Easter favors for you to see just in time for the holiday! Inspired by pretty pastels and the Easter bunny himself, you’re going to love how simple all three of these projects are to make, and your friends and family will love both the sweet packaging and the sweet treats inside! 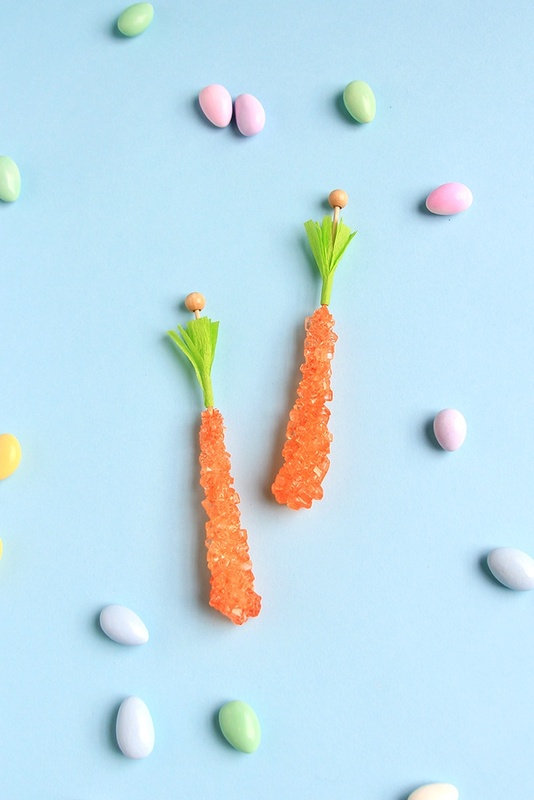 Keep reading to see how we made our three Easter favor ideas come to life and get inspired to make your own. Use a sharpie to draw a bunny’s face on one side of your clear box. 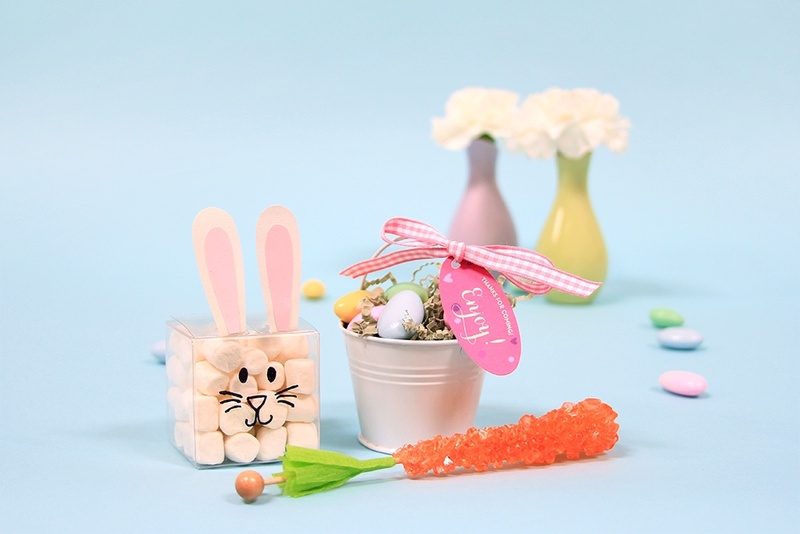 On the opposite side of the box, use a hot glue gun to glue a cotton ball (the bunny’s tail) onto the box. Next, using white and pink paper, draw and cut out bunny ears. You may have to use wire to make these stand up straight like we did. If that’s the case, then simply tape a piece of wire to the back of the ears, then tape or glue the ears onto the top lid of your box. Make sure that the front of the ears is facing the same way as the bunny face. Fill with marshmallows and you’re all set! Cut a piece of green paper streamer and use scissors to create fringe on one side. Next, wrap the streamer (with the fringe facing away from the rock candy) around the stick and use a piece of tape to secure it. Easy! Fill a mini pail about 3/4 of the way with paper grass and add your Jordan almonds on top. Next, tie a tag onto the pail’s handle using pretty ribbon. That’s it! Which of these ideas would you make for Easter day? 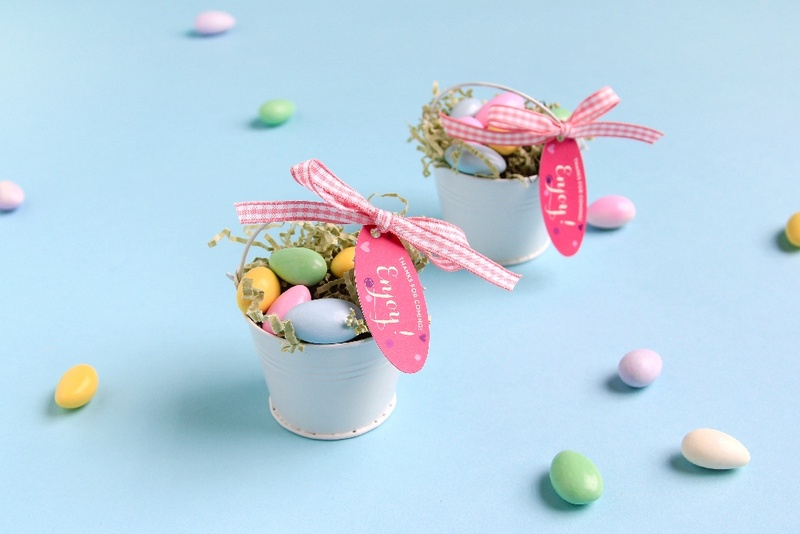 Are you having a gathering for Easter where you plan to give out favors? We love to hear from our readers, so please feel free to leave us a comment. We hope you have so much fun recreating these three ideas!